We have many ministry options for you! Please read through all options and contact ministry leader for more info. Class schedules can be found in the Welcome Center. Please contact Jorge Afanador at: jlafanador@gmail.com for more information. Hurts, hang-ups and habits that rob us of the fullness of life that Christ has for us are addressed in Celebrate Recovery, a program based on twelve Biblical steps and eight Beatitudes. Men and women are invited to attend on Thursday nights at 6:30pm. For more information, please e-mail: celebraterecovery@ridgewaychurch.com. Keep up to date with Celebrate Recovery by liking their Facebook Page! Joyful, Unique, Blessed, Image of God, Loving, Empowered, Eternal. Want to worship God with your musical and vocal talents? Join our music ministry! E-mail Pastor Sam for more information. If you are looking for choir resources, click here. If you are looking for musical resources, click here. If you are a young adult, ages 18-30, we would like to invite you to one of our gatherings. Every Sunday night at 7pm we come together with the intention of growing in relationship with each other and seeking after God. While we also have committed smaller communities of young adults that gather all around Westchester and NYC. All those interested can email Aaron: Aaron@RidgewayChurch.com, or contact the church office. Our goal is to make a difference in our church and community and fulfill God’s plan for our lives. Psalm 92:14 says “They shall still bring forth fruit in old age: They shall be fresh and flourishing. Retiring age doesn’t mean it’s over, it means “New Beginnings “. Our Lord wants to use us seniors to enhance His Kingdom. Please check Sunday’s bulletins and come out to our senior’s meetings. For more information contact Pastor Carl at pastorcarl@ridgewaychurch.com. We meet every Wednesday night at 7:00pm all ages welcome. We worship and praise our Lord as we pray for our personal needs and intercede on behalf of others. Note: If you cannot not attend and need prayer click here to submit a request and your prayers will be covered. For more information contact Pastor Carl at pastorcarl@ridgewaychurch.com. If you are in need of food, Ridgeway and the Foodbank for Westchester are here to help. 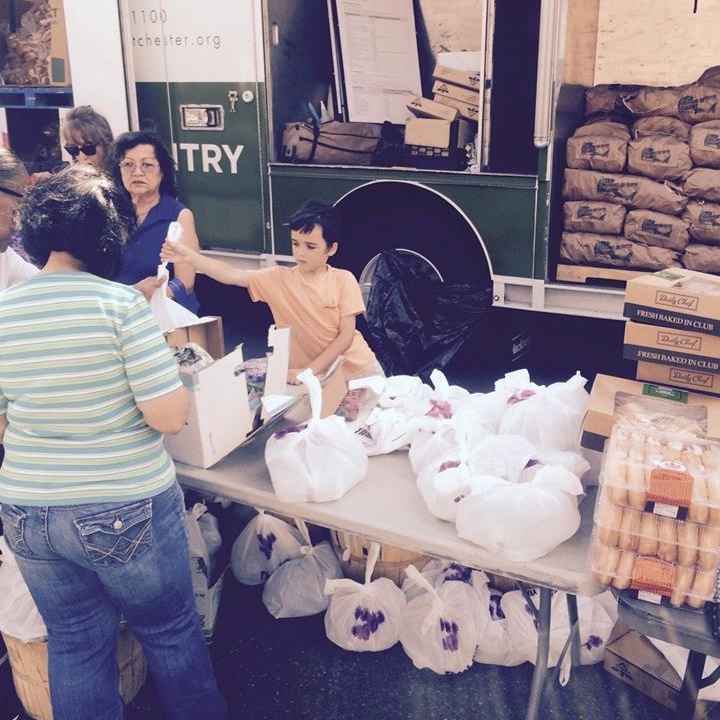 Our church food pantry is open Thursday's from 4pm-6pm, with mobile distributions happening weekly all over Westchester. Click here for schedule of mobile distributions. All those interested can email Jeff Meyer: sjm1070@aol.com, or visit our Facebook page. Charles Reale holds a men's bible study on Thursday evenings from 6:30pm-8:30pm in the adult library. E-mail Charles for more information: robnsdad@msn.com.